Lets start with some new business. As noted yesterday arrangement was made with the Lile Art Gallery in Amarillo to sell our prints. Today a tab was added at the top of the blog with contact information for prints ranging from nice office wall liners to museum quality, limited edition, numbered, matted, and signed series prints. The limited edition prints in two series, Icons of Route 66 and Ghost Towns of the Southwest are almost sold out. A new series, Ghost Towns of Route 66, is being developed to coincide with the release of a new book by the same title late next spring. #1001 – Route 66 on the eastern slope of the Black Mountains with the snow covered peaks of the Hualapai Mountains in the background. #1005 – This would be the same view of the Painted Desert Trading Post but in color. Please inquire if you have are looking for a print of a specific location. This tab also has the information pertaining to other photographic services offered. These include limited license stock photography for print or media as well as site specific assignment work. Also in the “New Business” category is the news that we have completed arrangement for a line of unique gifts that capture the essence of Route 66 and travel on the road less traveled utilizing the photographs of Jim Hinckley just in time for the holiday season. A tab for this with link has also been added to the top of the blog. The next item on the list is updates on some old business. The final edit for Ghost Towns of Route 66 will be in the hands of the publisher on Monday. The scheduled date for release has been adjusted to coincide with the big Route 66 event next June in Amarillo. 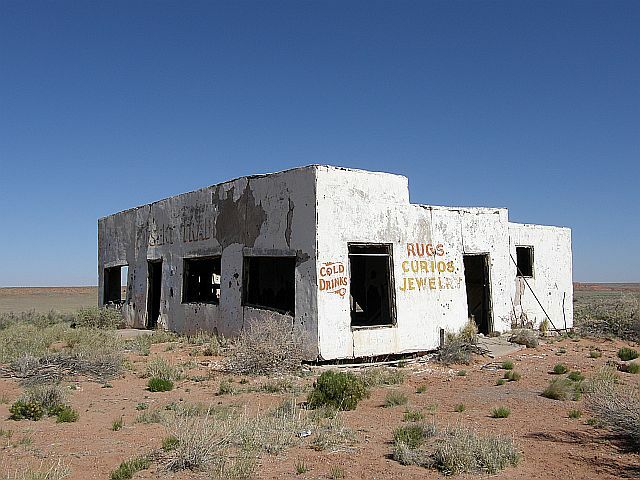 If you are interested in ghost towns I suggest you listen to the series on this topic that runs this week on KNAU radio in Flagstaff. Here is the link to listen on line and tonight there will be a one hour call in program beginning at 6:00 PM with yours truly fielding questions. While we are on the subject of ghost towns, it would seem Las Vegas is desperately working to avoid becoming one. I have sad news for the folks that floated this idea. Yes, ideas such as this have kept towns like Jerome or Bisbee in Arizona from blowing away but they are still ghost towns. On a final note for the day there is a very interesting motorcycle rally trolling through Kingman tomorrow as the riders make their way to the Santa Monica Pier. These intrepid riders left North Carolina about ten days ago on their pre 1916 motorcycles! I am in the take it or leave category when it comes to motorcycles but this is something to see. Not surprisingly, their stop in Kingman will be for lunch at the local Harley Davidson dealership. Here is a link with more information and the schedule of stops.